A friend had an idea for this fabulous sandwich, and it’s so easy, it’s barely a “recipe” at all! This simple sandwich is a tasty, spicy take on a classic comfort food, and it goes well with bleu cheese dressing and baked sweet potato fries. And it’s a great way to quiet a craving for buffalo wings without eating anything fried. 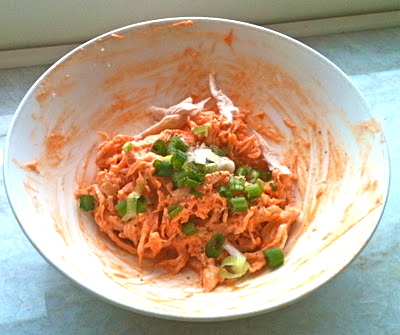 Combine chicken, hot sauce, mayo, green onion, and pepper to taste. Lightly butter 2 pieces of bread. The buttered sides will be the outer sides of the sandwich, the ones that touch the pan. 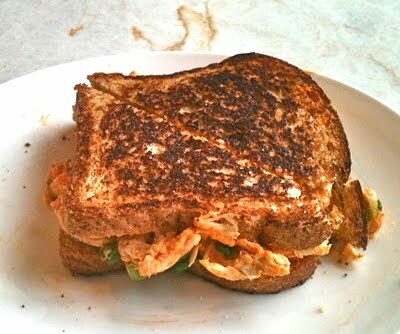 Assemble each sandwich with 1 cup of buffalo chicken and 1 slice of cheese. Transfer to heated pan and cover. Cook until browned on the bottom and flip. When both sides are browned, remove from heat. Serve with bleu cheese dressing on the side. Next Roasted Root Vegetable Soup.